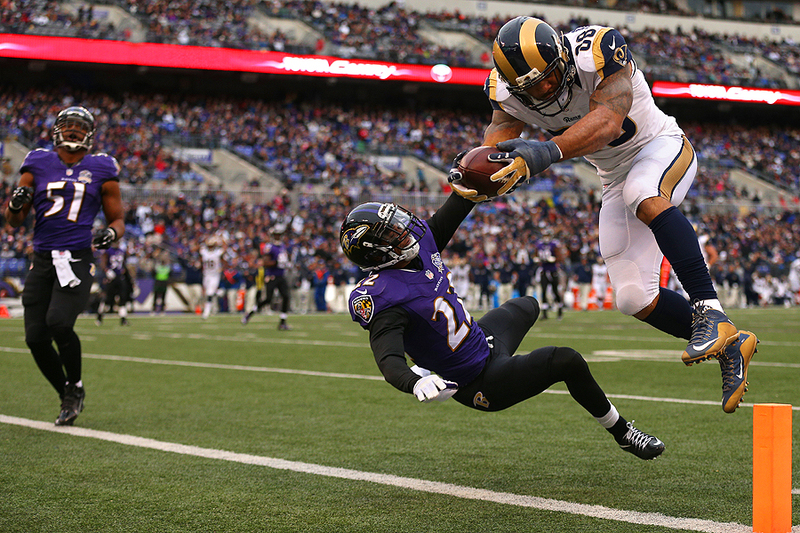 "Tight end Lance Kendricks #88 of the St. Louis Rams scores a third quarter touchdown past cornerback Jimmy Smith #22 of the Baltimore Ravens at M&T Bank Stadium on November 22, 2015 in Baltimore, Maryland." When I shot one of my very first college football games many, many years ago, I remember a photographer friend say something along the lines of - you have all the time in the world once the play starts. What he meant was that once the quarterback releases the ball, photographers have more than enough time to determine where the ball was going and what lens to use. While true, it's not always easy. Yet by remember that little phase, it helps keep yourself calm and collect during what could be a big play of the game. Last week, in the second half, with the score tight, Lance Kendricks of the St. Louis Rams caught the ball and started barreling straight toward me stationed in the corner of the endzone. While I had ample time to switch to a shorter lens, these type of close plays happen in an instant - and sometimes all you need to do is keep calm and focus, because if you get yourself overly excited, it could be the difference in nailing the shot and getting nailed yourself.